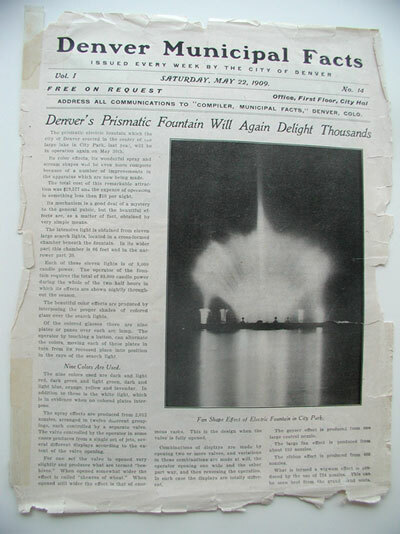 The prismatic electric fountain which the city of Denver erected in the center of the large lake in City Park, last year, will be in operation again on May 30th. Its color effects, its wonderful spray and stream shapes will be even more complete because of a number of improvements in the apparatus which are now being made. The total cost of this remarkable attraction was $19,517 and the expense of operation is something less than $10 per night. Its mechanism is a good deal of a mystery to the general public, but the beautiful effects are, as a matter of fact, obtained by very simple means. The intensive light is obtained from eleven large search lights, located In a cross-formed chamber beneath the fountain. In its wider part this chamber is 66 feet and in the narrower part 30. Each of these eleven lights is of 8,000 candle power. The operator of the fountain requires the total of 88,000 candle power during the whole of the two half hours in which its effects are shown nightly throughout the season. The beautiful color effects are produced by interposing the proper shades of colored glass over the search lights. Of the colored glasses there are nine plates or panes over each arc lamp. The operator by touching a button, can alternate the colors, moving each of these plates in turn from its recessed place into position in the rays of the search light. The nine colors used are dark and light red, dark green and light green, dark and light blue, orange, yellow and lavender. In addition to these is the white light, which is in evidence when no colored plates interpose. The spray effects are produced from 2,012 nozzles, arranged in twelve different groupings, each controlled by a separate valve. The valve controlled by the operator in some cases produces from a single set of jets, several different displays according to the extent of the valve opening. For one set the valve is opened very slightly and produces what are termed "beehives." When opened somewhat wider the effect is called "sheaves of wheat." When opened still wider the effect is that of enormous vases. This is the design when the valve is fully opened. Combinations of displays are made by opening two or more valves, and variations in these combinations are made at will, the operator opening one wide and the other part way, and then reversing the operation. In each case the displays are totally different. The geyser effect is produced from one large central nozzle. The large fan effect is produced from about 150 nozzles. The ribbon effect is produced from 400 nozzles. What is termed a wigwam effect is produced by the use of 724 nozzles. This can be seen best from the grand stand seats. The sprays rise in rows falling toward each other, there being six groupings at these "wigwam" sprays. Four Thousand Gallons a Minute. The fountain throws about four thousand gallons of water per minute. The operator is located in the north tower of the pavilion and can see exactly what effects he produces, and can vary them at will in minor as well as in larger details for color and degree of opening required for each valve to produce the most effective display. The color slides and water valves are moved by compressed air, which is controlled by electric magnets operated from handles in a roll top desk in the pavilion tower. The duties of the man under the fountain are simply to see that the air compressor works properly all the time, and as well to see that the search lights are not extinguished. 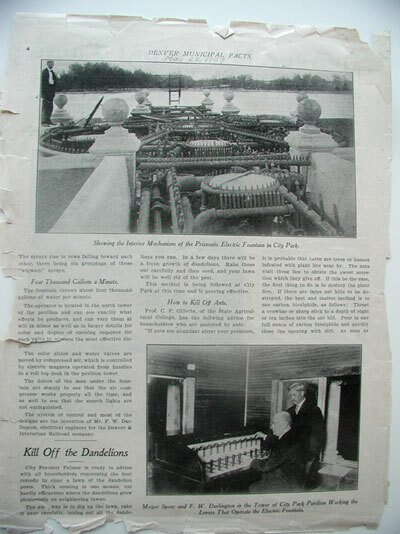 The system of control and most of the designs are the invention of Mr. F. W. Darlington, electrical engineer for the Denver & Interurban Railroad company.